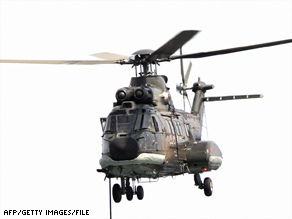 All 18 people aboard a helicopter that crashed off the coast of Scotland have been recovered alive, a Royal Air Force officer told CNN. The Super Puma ditched about 120 miles east of Aberdeen while approaching an offshore platform, said Barry Neilson, commander of the RAF’s aeronautical rescue coordination center at RAF Kinloss. The RAF was providing helicopter assistance to the Aberdeen Coast Guard. James Lyon, assistant controller at the RAF Kinloss center, said: “We have been picking up beacons from their lifejackets… Two aircraft are on the scene.” He did not know if the pilot transmitted a mayday before the aircraft ditched. “We believe it was quite close to the platform it was supposed to be landing on,” he added. The area is home to a number of offshore oil rigs. Lyon said he did not know which one the helicopter was heading to or where it was coming from. One RAF helicopter and one civilian helicopter were already on the scene, Neilson said, with two more civilian helicopters en route. Another RAF helicopter was providing support, he said, and surface vessels were also involved in the operation. The RAF received its first report of the crash at 6:43 p.m. (1:43 p.m. Eastern time). Lyon said the Super Puma is regularly used to transport people to and from oil platforms in the North Sea and as far as he was aware it has a good safety record. Weather at the crash site is relatively good, though slight fog is hampering visibility, he said.